Stephens Glassware All Purpose Wine Glass 16oz. Home > Host & Hostess Gifts > Tabletop > Glassware > Stephen's Glassware Corporation > All Purpose Wine Glass 16oz. Style: # 46961 16 oz. 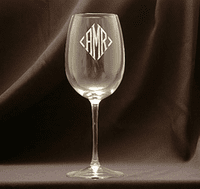 Monogram: Font Style: Please Choose OneNoneMono #1Mono #2Mono #3Mono #4DMono #5Mono #6Mono #8 Who is this item for? A larger version of the 12 oz. wine glass from Stephens Glassware. Its' generous size and classic shape combine well for swirling and holding the bouquet. The glass stands 9" tall. Measurements and capacities are approximate.